My ancestors are from Japan where our breed is honored and respected. 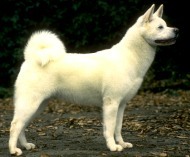 The Akita is the largest of the Japanese dog breeds and was used originally to hunt wild game. These days most of us work with the police or in some other guard-dog position because we are so rugged and athletic. I have a reputation for being pretty independent and a little on the stubborn side, but I know some humans who are pretty stubborn, too. When fully grown, I am between 24 and 27 inches tall (61 to 68.6 centimeters) and I weigh between 77 and 110 pounds (34.6 to 49.5 kilograms). We have no Akita Breeders listed at this time. Click here to place your Akita Ad!